Leroy W. Meier; Beloved husband of Hilda R. (nee Ries) Meier; Devoted father of Linda S. (Chad Ford) Meier, Elaine G. (Greg) Lewis, Karen L. (Kevin) Jeffrey and Arleen M. (Greg) Poquette; Dear grandfather of Ann, Meghan, Meredith and great grandfather of Iley Ries; Brother of Lois Wingerberg; Passed away on Sunday, Oct. 16, 2016; Age 81; Residence Colerain Twp. 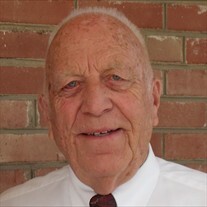 ; Leroy was the former Mayor of Mt. Healthy, Chairman of the Board at Arlington Memorial Gardens and was a member of the Mt. Healthy Christian Church, Mt. Healthy Eagles, Republican Club and Christian Menâ€™s Fellowship; Visitation will be held at Neidhard-Young Funeral Home 7401 Hamilton Ave., Mt. Healthy on Wednesday, Oct. 19, 2016 from 9 AM until time of Funeral Service at 11 AM with burial to follow at Arlington Memorial Gardens; Donations may be sent to City Gospel Mission.